Following the pre-match preparation by Florian, Nigel, Lucas, Danio, Oli, Coach Dave and "The lost somewhere in Leeds" James, it was proven by the first set performance of Leeds VC that Guinness does live up to its slogan of "Good things come to those who wait" Coach Speers certainly had to wait for the Div 1 champions to decide that they wanted to play. The next 3 sets saw Leeds do enough to beat a Watford team who were fighting for Div 1 survival. 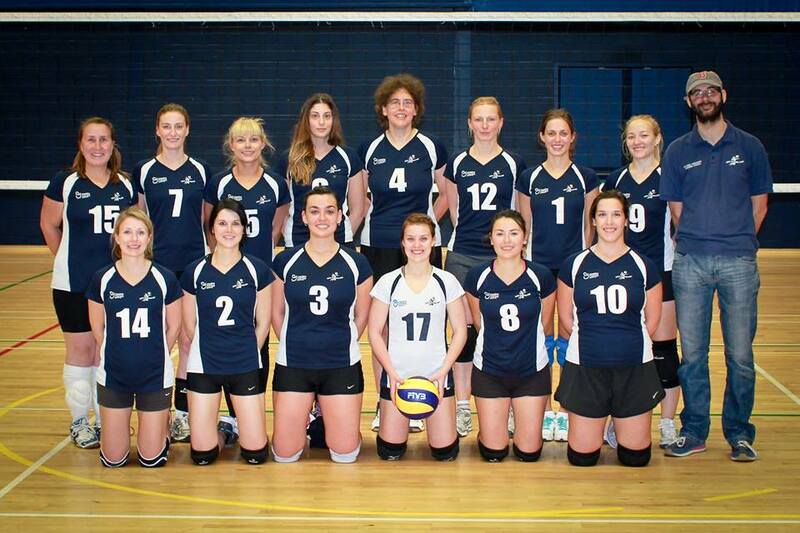 Thanks to all who turned up to the weekend's games and watched Leeds make history winning two back to back NVL titles. Thanks to our team kit sponsor "Phoenix Safety" of Pudsey and "The Eldon" for post match catering. To all members of Leeds VC who have help the team to achieve this season. Finally to all the players who have given their time and commitment to make Leeds a "Super 8" team. We wish Florian good luck in his future teaching career and hope he has fond memories of his time with us!! Leeds seal the Div 1 Title!! Playing in front of the biggest crowd of the season Leeds took a weakened Wessex team with ease! Coach Speers deliberately played down the importance of this game. After an inconsistent start Berry came to the service position and took Leeds into an 8-3 lead. Strong blocking from Rutikanga and Sibanda saw Leeds 16-8 in front at the 2nd technical time out. Berry put in another good service run taking Leeds to 23 before Herczeg finished the set 25-16. Leeds lost their way in the 2nd set and allowed Wessex to get themselves back into the game. Trading points to 20-20 Coach Speers introduced Telis to add more passion into his team. Wessex took their opportunity through outside power hitting from Roberts attacking the DiFederico block. Taking the set 25-20. Coach Speers knew that this loss would bring back the fighting spirit for Leeds. 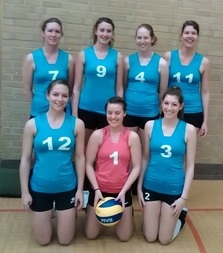 Focusing on Service and Block, Leeds routed the Wessex defence, taking the next two sets 25-13 and 25-14. "Leeds are just 3 points away from the 1st division title"
A near full strength Leeds travelled for their final away match against a resurgent Birmingham side. After some confusion as to which Sports centre was the venue for the game, Leeds managed to get all their players on court on time! Neubrand started the 1st set well attacking with his serve on to the Birmingham passing unit. At 5-0 up Leeds looked rampant, attacking through all positions. Capt. DiFederico added a 4 point serve tally that ended any attempt of Birmingham to get into the set. Coach Speers warned his team of becoming complacent which proved to be the case as Birmingham came out fighting with some good attacks through their opposite, left handed player. Leeds managed to hold on and took a 4 point lead at the 16 point technical time out. Birmingham started to apply their service pressure and combined with some excellent defensive pickups took a 19-16 lead. Coach Speers took his 1st time out to try to focus his players and stop the Birmingham serve. Leeds made some poor defensive errors which coupled with Herczeg and Neubrand finding the Birmingham block too often, saw Birmingham back in the game at 1-1. The 3rd set saw Birmingham take an early 8-4 lead. Herczeg stepped up his game serving 7 points to bring Leeds back into the set. Strong middle attacking and blocking from Telis and Sibanda pushed Leeds ahead to take the set. In the 4th set Leeds pushed hard from the start and with a 10-3 lead the game was all but over. Birmingham tried to muster some pride and put on an impressive display in defence from the attacks of Rutikanga, Neubrand and Herczeg. However it was only time before Leeds finished the match to 18. MVP Capt. DiFederico CMOTM. Telis. Leeds have just 2 home games left this season. Sat. 21st March v Wessex. 12.45pm start. Sun 22nd March v Danes Watford. 1.45pm. start. Please come along and support Leeds to their 1st Division Championship title!!! "Leeds VC just 3 games off the Div 1 title". Leeds continued their unbeaten run this weekend taking on 6th place Essex Blaze. After Capt. DiFederico's outstanding performance on Saturday against Tendring. Coach Speers went back to his 2 libero option. Essex fielding a full strength team took the game to Leeds leading by 13 -9. Strong service pressure from Neubrand, Telis and Herczeg levelled the score to 20-20. Leeds showed their experience at closing down sets taking the 1st to 23. The 2nd set went a similar pattern to the 1st. Blaze taking the early lead and Leeds fighting back through strong outside attacking from Neubrand, Rutikanga and Herczeg powering the ball off the Essex block. 25-18. The 3rd set saw Leeds drop in performance allowing a now desperate Essex team to take control 20-14. Coach Speers took 2 quick time outs in a bid to try to get his team back into rhythm. Leeds almost pulled it off closing the gap to 23-22. Yet another service error gave Essex set point and they managed to take the set 25-23! The loss of the set gave Leeds the incentive that they were looking for and focussed the defence to fight against the Essex fast middle attacks. Sibanda made 2 consecutive reactive pick-ups and served Leeds into a 10-6 lead. Capt DiFederico increased the baseline pressure turning Essex hope into despair with athletic defence and 2nd touch attacks taking Leeds to an unassailable 19-10 lead. With Essex coach Lewis lost for answers, he sat out to watch his teams mauling. Strong blocking from Telis and heavy power hitting from Herczeg allowed Rutikanga to serve out the set 25-14. Leeds now have a 4 week break in their fixtures. Next game is away to Birmingham and finishing the season with a home weekend against 2nd place Wessex and bottom of the table Danes Watford. Book your place at Gryphon SC on Saturday 21st March, 12.45pm for the top of the table game! Leeds travelled away to Frinton-on-sea & Chelmsford this weekend in their bid for the title! Coach Speers had a tough decision to make before the Tendring game. Capt. and setter Di Federico was still suffering with a groin strain and missed training to rest it this week. With just 7 regular attacking players plus both liberos travelling he decided to take a cautious approach and moved Lindley into the main team. Tendring's home record was impressive with just one defeat all season. Leeds knew that they were in for a tough match. Leeds started well then slipped 2-6 down before Rutikanga stepped onto the baseline. With attacking jump serves he punished the Tendring passing unit, taking Leeds into an 9-6 lead. Leeds kept the lead despite 7 serving errors and at 17-14 up introduced Telis for Berry to try to strengthen the serve. The change worked, with Leeds taking the set to 21. Coach Speers however was not happy with his players focus and used the end changeover to settle his team and concentrate on the basics. The 2nd set saw a better service and attacking performance from Leeds and the set was won to 19. Tendring pushed hard all the way in the 3rd set but some individual outstanding attacking from Neubrand and Herczeg coupled with strong blocking from Rutikanga and DiFederico saw Leeds take the lead. A controversial missed net touch by Sibanda took Leeds to 24 with Rutikanga finishing the match. MVP - Sibanda. CMOTM - Herczeg. An excellent team performance brought about Leeds Panthers first victory in 2015, the reverse fixture earlier in the season had been a comfortable victory for the University team. With this in mind, Panthers started in a very nervous fashion and York Uni produced some very powerful serving and quick attacks which Panthers struggled to deal with. The first set was over very quickly in favour of York Uni 8-25. Coach Gregory made several changes to the starting 6 in order to try and match up with the main threat from York Uni. Austick soon got into her stride at the net with commanding attacking and blocking. With York Uni under pressure, Panthers were the stronger team from the baseline due to their renewed confidence and aggression. Excellent defensive work from Pentecouteau, Bugayska and Teale left the Uni team struggling to kill the ball and Panthers took the second set 25-19. The third set followed a similar pattern with impressive net play from Austick and great set distribution from Teasdale never allowing York Uni to settle at the block. Panthers were now commanding all aspects of play and cruised to win the set 25-15. York Uni started the fourth set determined to take the match to 5 sets. Panthers however could see the finishing line and looked to maintain their aggressive serving and excellent block defence. A late rally by the Uni team put the Panthers under pressure but Leeds closed the set and the match out winning 25-20. Panthers next game is against title chasing Beverley in two weeks. Leeds take just 75 minutes to despatch Coventry Riga. 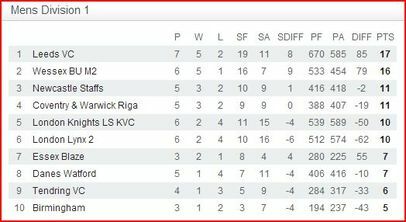 After a months Christmas break between games Leeds took their strongest squad to take on a resurgent Coventry Riga team. In the pre-match team talk, Coach Speers warned his team not to be complacent about this game as Riga had only lost 2 games all season. They had registered a number of new players that had turned what was a team spiralling down to Div 2 back into contention for Div 1 winners. Leeds looked nervous in the opening encounters and poor service reception saw them 7-5 down till Herczeg served them back to 8-7 at the 1st technical time out. Sibanda carried on the service pressure taking Leeds to a 12-8 lead. Captain DiFederico took Leeds to 16-11 at the 2nd technical time out. At 17-20 down the Riga coach introduced his 2.03m Bermuda international player, to inject some attack power. This proved too late to save his team and Leeds took the 1st set to 18. The 2nd set followed a similar pattern with Leeds coach trying out Teles in his new middle attacking role. Riga fought hard on the wings, attacking the outside edge of the Leeds block and brought them back into the set at 20-20. Rutikanga served Leeds into a 24-21 lead with Herczeg finishing the set 25-21. The 3rd and final set saw coach Speers switch Teles for Adil. Herczeg once again served Leeds into a 9-5 lead and Capt. DiFederico followed up to 15-10. Riga pushed hard to get the set back into contention, but some strong blocking and middle attacks from Sibanda supported by athletic defence from Gregory, Neubrand and Herczeg proved too much for the home side and Leeds took the match 25-20. Leeds MVP - Capt. Daniel DiFederico. CMOTM - Roland Herczeg. Leeds travel away to Tendring and Essex Blaze next weekend. After last week’s narrow defeat to Beverley ladies, coach Gregory was looking to get back to winning ways. An experimental starting six took a commanding victory in the first set with some excellent play from all concerned, good service pressure from Gregory and Mazurek, awesome defence from Aulton and Mazurek and some solid front line hitting from Pavanetti and King fed from the deft setting skills of Teasdale. The inclusion of Tinkler by Coach Gregory half way through the set added some excellent net play to the equation. The Panthers with a changed starting six from coach Gregory eased off at the start of the second set allowing HEYVA back into the match and build a commanding lead, but the Panthers snatched the set with great defensive work from Carrick and excellent serving from Teale and Austick to close out the set. The third set followed in much the same way as the second set, with HEYVA pulling away from the Panthers, but some school boy rotation faults from HEYVA and some effective hitting through the middle from Tseka and Mazurek led to a nail biting finish to the set, Panthers eventually closing out the set 32-30. A morale boosting performance from the Panthers before they attempt to take the sting out of top of the table Scorpions on Wednesday in Barnsley. 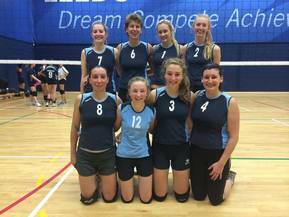 A second double header weekend in succession brought Leeds in competition with teams at the top and lower reaches of the league table. The carousel of University sport funding has arrived at Durham, and last year’s national cup semi-finalists have strengthened their squad with a number of additional overseas scholars. If they continue to perform to their ability, Durham are likely to repeat the BUCS and Student Cup success of last season. As such, Saturday’s game was a mismatch, from which neither side took benefit. Durham are currently carving through the league system on their way towards a Super8’s berth, whereupon history dictates that the funding will eventually evaporate, along with any precariously sown seeds of infrastructure, home grown tacitly developed players and the opportunity for a long term legacy. Let’s hope on this occasion a good education prevails and history doesn’t repeat itself, although the evidence is weak. Leeds plundered their financial coffers, and having scoured the transfer market for talent brought in two new right side players; Dvulova and Farrar. These additions delivered the benefit of having their first squad of more than seven players for the Sunday match against Loughborough, and whilst their coach was still pondering the existential nature of tactical substitutions, the first six cruised to a five point lead in the first set. Obviously, merely the threat of spending time on the bench was enough to solicit a reaction from the entire team, and cardboard cut-out substitutes have been purchased for future matches. Dvulova set a solid platform in the second set, through steady execution and solid attack option selection, allowing Breaks and Capt Porter to kill the ball consistently through the wing. Slap happy Edine Pape blocked well, through her recently adopted opposite position, and served with great intent to keep Leeds in control of the match throughout the second set. Loughborough ran their bench in the third set, and never seemed to be fully confident as a team. Leeds bounced in to a maintainable lead and closed out the set and the game. "Leeds grind out another win"
"Not our most entertaining performance but we got the result" was the comment from coach Speers talking to his team after the game. After 4 tough matches in 9 days Leeds have moved away from their nearest rivals Wessex and are 4 points clear at the top of Div1. The match against Birmingham was always going to be a tough one. Currently bottom of the league, Birmingham started well and at 17-11 up forced coach Speers to make changes to try to get back the set. Things did not improve as unforced errors and inconsistent blocking took the 1st set away from Leeds 25-19. The 3rd set proved to be the real grind with both teams taking points and matching each other to 22-22. Neubrand attacking with serve forced a free ball out from Birmingham and Herczeg smashed it home. A controversial decision by referee Smart saw Leeds move to set point and Herczeg again finished the set with a powerful cross court attack. 25-23. Birmingham fell apart in the 4th set as Leeds took an 11 point lead. The result was inevitable but at match point Rutikanga was forced to the subs bench after colliding with Libero Gregory in their attempt to save a tactical ball in the centre of the Leeds court. Cuper stepped in to plug the gap and Neubrand smashed through the Birmingham block for victory. 25-14. Leeds now face a double header away to Danes Watford and their closest rivals Wessex on 6th & 7th December. Finishing their first half of the year at home on 14th December to Tendring. 12.45pm start. An unstoppable Leeds team showed Essex Blaze a different level of play. From the first point Leeds took command, running away with a 5-0 start forcing Essex coach to take an early time out. Leeds kept on the pressure with Rutikanga serving to a 13-5 lead followed by Neubrand taking Leeds to 21-11. This service pressure was backed up by consistent passing from Libero Gregory. The 2nd set continued in the same vein with Berry serving Leeds to a 9-3 lead. Leeds took their advantage and pushed back the Essex attack with strong blocking from Herczeg & Sibanda, running out 25-18. Coach Speers warned his players to expect a tough 3rd set and this proved to be the case. Essex took the lead at the 1st and 2nd technical time outs. Then in an effort to increase his block strength coach Warren brought his tall middle player on for his front court setter. Capt. Danio spotted the weakness this made in their passing unit and attacked the middle player with his serve. Despite all the advice offered by coach Warren in trying to cover the weakness, Danio took Leeds all the way to match point. Neubrand finished the match in style tipping the ball into deep 5. MVP - Neubrand. CMOTM - Herczeg. For their latest fixture, Leeds made the short trip across the University to The Edge to take on the League's new boys. Prior to the game Coach Harrison warned that the opposition would be unpredictable, which turned out to be an understatement of epic proportions. Leeds cruised through the first set and a comfortable win looked on the cards. However, Saudi changed their line-up for the second set and this, combined with an air of complacency, meant that Leeds barely reached double figures. It was almost like the game was being played in a parallel universe. The third set started in a similar vein and Leeds were always chasing their tails. A late fightback ensured that the score was at least respectable. The writing was now well and truly on the wall... Leeds knew they had a battle on their hands in order to win the game. The fourth set was still pretty tight but Leeds showed why they have been so hard to beat this season. Bakula and Thompson Jnr displayed some fine hitting through 4, libero Alston dominated service reception and Modoolla remembered he wasn't sat on a beach sipping cocktails. In the deciding set Leeds started well and always looked in control. A sublime shot at a crucial time from Thompson Jnr gave Leeds set point and they wrapped up an extremely hard-fought win. The whole team showed great strength of character and the win took Leeds back to the top of the league! The team consisted of a good mixture of experience and youth. This was a game when the serve became a powerful tool against the opposition. The first set saw a bit of an unsettled start with inconsistent serve receive but as the set progressed leeds settled and finished the set 25:15. In the second set Leeds made uncharacteristic errors and struggled to attack consistently. Eleanor James' came around to serve and from being 13:18 down took the team to a 23:18 lead. The team regained composure and finished the set on the next rotation 25:22. In the third, Leeds continued as they finished the second playing with control and scoring through all attack positions. Eleanor James came around to serve and once again caused problems for Harrogate taking Leeds from 15:11 to 22:11. This proved too much for Harrogate and the set finished 25:14. Well done Leeds Academy, very solid performance against Harrogate winning 3-0. Due to injury and work commitments, Leeds again were forced to approach a fixture double header weekend with only the bare minimum available players. After a slow start in the first two sets against top of the league leaders Manchester, the Leeds outfit started to work their way in to the match in the third set and led at the second technical time-out by four points, however Manchester brought their captain and best player back on to court, and the crowd became entertained by a tortoise and hare race to 25 points. The officials, keen to exercise Olympic level handling regulations in the third tier of UK amateur sport, continued to play their part. With everyone enjoying the entertaining Volleyball at 23-22 to Leeds, the set was brought to a premature end, with Leeds being penalised for consecutive carries. The likely outcome of the match did not change, but the fun police had left their mark. Leeds started well against North Ridings Eagles, and the early exchanges brought Leeds 3 set points in the first set, however the temperament to close out sets was lacking from Leeds, and despite two time-out to try to stem the flow of points, the set slipped away. Eagles who are riding a wave of early season euphoria after being promoted continued to perform well, and as Leeds suffered with an inability to execute some key skills, as the game drifted from their grasp. With two more matches the following weekend, Leeds will surely be turning to the transfer market to widen the strength and depth of their team roster? The pre-match team talk set the scene for today's performance with coach Speers demanding more from his passing and blocking players. Leeds needed to get revenge for their 3-2 loss earlier this season. Newcastle started strongly channelling their service onto Telis and Lindley. Coach Speers was forced to change his game plan as Telis injured his knee and was replaced by Neuberg. Leeds struggled to find any consistency making too many unforced errors and never got into the set losing to 20. Focusing on service and block, Leeds took control from the start taking an early lead. Powerful outside hitting from Herczeg & Neuberg kept the Newcastle defence busy and Rutikanga started to find his range often hitting over the Staffs block! Leeds still did not look comfortable often losing the longer rallies even though they had the set won to 14. Coach Speers made a tactical switch swapping the starting positions of his outside hitters. The change worked and Leeds started putting in consistent passing allowing Capt. Danio to use all attacking options. Staffs fought back with Leeds just holding the lead 16-14 at the 2nd technical time- out. Herczeg found Staffs' weak receiver picking up 4 points and killing the Staffs momentum. Leeds finished the set to 19. The 4th set saw Staffs fighting to stay in the match. Both teams were exchanging points in the first third but strong blocking took Leeds into a small lead. Newcastle fought back to level the set at 23-23. Coach Speers took his final time-out settling his team and directing the attack over the Staffs weakest players. Neuberg smashed over the block and Leeds had match point. Newcastle called their final time-out knowing that it was make or break point! Herczeg kept his service pressure forcing Staffs to attack through 2. A wild smash ended up on the end wall and Leeds started to celebrate their win when the 2nd official called a net touch against Leeds. 24-24. Leeds kept their focus attacking on the outside but Staffs defence kept them in the game. Leeds attacked again through 2, Rutikanga powered the ball off the outside block 25-24. Leeds kept up the powerful hitting tempo and the spectators were entertained by some outstanding pickups from both teams. Leeds never let their advantage go and at 26-26, Herczeg moved to position 4. Staffs saw the writing on the wall. Leeds setter Danio delivered the pass and Herczeg powered a winning cross court attack. 27-26. Neuberg held his nerve serving into deep 6. Leeds libero Gregory picked up the Newcastle attack and Herczeg on his 2nd attack forced a defensive error to win the match 28-26. Playing their first home game in front of the team kit sponsor, Leeds started nervously. Strong opening service pressure took Knights into an 8-5 lead. Coach Speers made an early substitution replacing Telis for Robert in a bid to add more power to the outside attack. Leeds struggling to find any rhythm switched Libero's Lindley for Gregory. Knights kept up their pressure service and strong outside attack. Coach Speers final move was to sub Capt. Danio for Rutikanga in a bid to strengthen the attack. Small errors finally cost Leeds the 1st set. The 2nd set saw Leeds start to show their potential with both middle blockers involved in some strong cross court blocking. Leeds always kept a slender lead finally pushing home to take the 2nd set 25-18. In the 3rd set, Leeds again made heavy weather of the service reception, letting Knights control the play. Coach Speers again tried to strengthen the teams attack replacing his front court setter for Neuberg. The switch paid off and Leeds fought back to 21-21. Three attack errors cost Leeds the set 23-25. Leeds now had to go all the way to 5 sets to win the game. This seemed to focus their game and the spectators were given a great display of power hitting and attacking blocks. Leeds dominated the 4th and 5th sets winning 25-13 and 15-6. After a superb unbeaten start to the season, Leeds were brought crashing back down to earth in spectacular fashion by a much improved Barnsley team. Leeds were still without Modoolla, presumably baked to a crisp in North Africa and also lost Capt. Potter to injury. As usual, Barnsley were particularly fired up while Leeds on the other hand were lacklustre and looked a shadow of their former selves. On a positive note, Leeds showed great character to come from 24-21 down in the first set to win it but they couldn't reproduce anything near to this in the following sets. Some great serving from McKenna and Thompson Snr in the fourth set offered a glimmer of hope but it just wasn't to be. 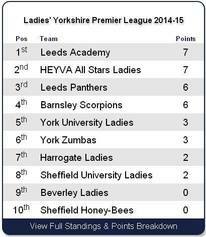 Leeds climbed to the top of the Yorkshire Premier League with a convincing win over Hull Thunder. With only the exception of Modoolla topping up his tan in Morocco, Coach Harrison was able to call on a full-strength squad for what was potentially a tough fixture. The late arrival of some of the Hull players seemed to affect them in the first set and Leeds, through solid service and powerful hitting, comfortably won it 25-16. The second set followed a similar pattern and Leeds were always in front taking it 25-18. The early stage of the third set saw both teams trade points until Leeds managed to build a 16-10 lead, only to find themselves pegged back by an improving Hull team. Having looked to be heading for a straightforward win, Leeds found themselves 20-19 behind. This was enough to give Leeds a proverbial kick up the behind and they stepped up a gear, with superb serving from Thompson Jnr and clinical hitting through all positions to round off a good night's work. A few fireworks were still going off in the Gryphon this Sunday when an unbeaten Beverley team visited, to play the new Leeds Academy squad. After a hard fought match Beverley retained their unbeaten status, but not before a few unwelcome bangers had been unleashed from both sides. After the Panthers' first defeat against York Uni last week they returned to the top of the Yorkshire Premier League after a commanding performance. A full squad of 12 players turned out to play. The game saw Teale returning as setter and Tinkler making her first appearance of the season. The first set started well with excellent service pressure from Austick and assertive hitting through 4 from Pavanetti, a change in setters from Sheffield could not stop the barrage of aggressive serving, hitting and blocking from the Panthers. A slow start in the second set left the teams trading points, but an excellent service run from Bugayska and Sheffield using a third setter, set up another dominant performance particularly from the impressive middle blocking and hitting from Tarrant and Mazurek. Aulton and Gregory were introduced in the third set starting line-up and the barrage continued, but some improved defence and service pressure from Sheffield allowed them a glimmer of hope, further changes from coach Gregory allowed the squad to get some useful court time, an attempted overhead kick set attempt from Teale was the highlight of a straight forward set victory. A very decisive 3-0 triumph, well played girls! CMVP - Pavanetti. CMIP - Tarrant. Leeds continued to improve and battled their way to an important second victory of the season against a fast maturing Redhill Tigers squad. Redhill were well prepared for the start of the match, and caught Leeds napping in the first set, pulling in to an early lead that Leeds never quite managed to close down. Leeds brought on James for her national league debut, and she performed well in a difficult situation. Finishing the first set strongly helped Leeds to carry momentum in to the second set, and some consistent serving from Turnock allowed them pull out a commanding lead. Rout’s setting improved and with it the consistency of the attack, particularly by Schonhofer through the middle. The third set followed a similar trend and Leeds seemed to be cruising toward a relatively straightforward win over Redhill for the second time this season. However, in the fourth set Leeds had too much of a laissez-faire attitude, and when Redhill began to up their game, they were too slow to respond with meaningful play. A fifth set can be a lottery, with the two teams fairly evenly matched at times and with Redhill fielding a relatively inexperienced team, it was important that Leeds took an early lead. Fortunately Turnock found some rhythm from the service line, and at the turn it was 8-2 to Leeds. Leeds again relaxed, and allowed Redhill to slowly pull closer, however the gap was too great and Leeds slide over the finish line relatively comfortably. With more training both teams are set to have a solid seasons. Leeds stomped on London Lynx to repay the London team for their home win over Leeds two weeks earlier. Coach Speers was looking forward to their home encounter with nearly all his players available for this home game. Setting up his team to try to counter the Lynx power hitter No.4 he started his setter at 5. Lynx changed their previous encounter line up putting No.4 against Leeds' lowest block. Leeds took an early lead in the 1st set and at 15-7 up, introduced Neubrand, his new German player, to replace Capt at position 4. Rutikanga switched to setter and gave Neubrand his 1st attack, over the block cut into 1. Point. Lynx attacked again at 4 through their power hitter. Neubrand and Sabanda took him out. Point. Coach Speers added his other new French signing Robert to replace Cuper. His 1st attack hit through the block. Point. Herczeg went for his smash serve causing Lynx to pass back to Leeds. Adil kill hit through middle. Point. Leeds finished off the set attacking at will. Lynx never really recovered from the mauling. Leeds were eager to show their block strength with Coach Speers matching up his strongest block against Lynx power hitter. Time and time again Leeds pushed his attack down at his feet! Lynx having no other options kept feeding their main hitter to watch him destroyed by Rutikanga's block. Set 3 followed the same as set 2 with Leeds attacking at will and Lynx making some excellent defensive pickups to try to compete. Victory was inevitable for Leeds. Best performance of the season! MVP - Herczeg. CMOTM - Neubrand. Leeds were able to field a virtually full-strength squad for the visit of Hawks, traditionally formidable opponents. Hawks, on the other hand, were slightly understrength using one of their middle hitters as setter. There was a sense in the arena that maybe, just maybe this was the ideal opportunity for Leeds to exploit the opposition and maintain their unbeaten start to the season. The packed house soon learnt that Hawks should never be underestimated and a nervous start from Leeds saw both teams trade points until Leeds gained the upper hand and at 24-21 had the first set within their sweaty grasp. Hawks' 'never say die' attitude came to the fore and they pulled it back to take it 28-26. Undeterred by this Leeds quickly found their rhythm and, in stark contrast to the first set, completely dominated the second and third sets winning both to 11. The sweet scent of victory again pervaded the air but the dark spectre of complacency threw a shadow over proceedings as Hawks, with a change of formation, took the fourth set to send the game to a decider. Like a greyhound on speed Leeds raced out of the blocks into a 4-1 lead. Hawks had no answer to Leeds' power hitters and began to crumble. The capacity crowd could smell blood and even the over-zealous leisure assistant was powerless to stop Leeds claiming a memorable victory! CMVP - Paul 'Potato Hands' McKenna. Leeds Academy moved to top of the Yorkshire Premier League with a 3 - 0 home win over a depleted Sheffield University team. After a tight first set, where the Academy took time to work out the management of Sheffield's primary attacker, the game turned strongly in Leeds favour. Hills started to connect consistently with Rout's sets to the middle, and James dug the daylights out of it. The Academy cruised to a three set victory, and the top of the table. After the euphoria of last week's hard fought win against Sheffield Scorpions, Leeds were back on home turf for an encounter against much more familiar opposition. Leeds again had only 7 players available and handed débuts to new boys Modoolla and McKenna, both free agents from the now defunct Garforth team. On paper a comfortable win was in the offing but unfortunately York hadn't read the script and the game wasn't actually played on paper. The first set was a tentative affair with Leeds struggling to get into their stride and assert any kind of dominance. Strong serving from Modoolla and Potter helped Leeds into a 17-10 lead but schoolboy errors allowed York a glimmer of hope. Bakula, determined not to be outdone in the service department, took Leeds to within spitting distance and eventually they took the first set. In time honoured tradition, the second set followed and after a solid start Leeds' hitters were beginning to find their range. In particular, new boy Modoolla was attacking the net with the speed of a cheetah on MCAT. A number of long rallies ensued keeping York within touching distance until Bakula came to the service line. The lanky Pole, inspired by his country's win at the recent World Championships, produced a master class in service, previously only seen at The Ivy. Eight points later and Leeds were 22-10 up and cruising towards the third set. York refused to give up and the 25-15 scoreline did not accurately reflect their dogged determination. The final set was an altogether more straightforward affair. Leeds raced into an 16-3 lead, thanks in no small part to excellent serving from Potter, Williamson and Santoro, and powerful middle hitting from Echaniz and McKenna. Even the one man and his dog in the crowd decided it was a foregone conclusion and left early to get home in time for the X Factor results. It was left to Captain Potter to serve out the rest of the set for an emphatic 25-9 finish and send Leeds to the top of the league. CMVP - He's a handsome boy, it's Shehzad Modoolla. After their first away win Leeds were brought back down to earth in their second 5 set game that weekend! With just 9 fit players available and limited options in substitutions coach Speers faced a fresh Lynx 2 team who had a similar kill attacker to their previous opponents London Knights. Leeds never really settled into the 1st set as Lynx's outside power attack started to punish the Leeds block. The 2nd set saw Leeds take an early lead but again Lynx fought back keeping the pressure on the wings and frustrating the Leeds defence. Only through some clever hitting by Telis and 2nd touch attacks by Capt. Di Federico brought the game back to 1-1. Poor service and passing errors added to Leeds' problems which put pressure on the setter to make anything except predictable sets to Herczeg and Telis. Leeds were starting to look down and out. Coach Speers tried a different starting order in an attempt to strengthen the block against Lynx2's power hitter. Sibanda and Berry rose to the challenge and finally started to make some telling blocks, coupled by ferocious jump serves from Herczeg, Leeds. Levelled the game 2-2. The fifth set saw both sides fight point for point when at 10 -9 down Leeds made 2 telling blocks against Lynx's power hitter. Leeds just missed out on their 3rd block, taking the score to 11-11. Herczeg powered his smash off the Lynx block 11-12 and went back to serve. Another hard Jump serve saw Lynx overpass and Telis blocked the ball to take it to 11-13 Leeds. Lynx again frustrated the leeds block bursting through the waiting hands of Sibanda and dropping just behind him. 12-13. Now both teams had their kill attackers in back court. Lynx served a deep jump floater which Libero Lindley called "out" only to see the ball dip and touch the baseline. 13-13. Poor service reception forced another predictable set out wide to Telis who went and missed the top of the block. 14-13 Lynx. The final rally saw tentative attacking and superb defence from both teams trying to get the attack advantage. Finally Lynx went for the Leeds block bursting through the seam and dropping behind for the point and match! MVP and CMOTM - Herczeg. Next game Sunday 2nd November, 14.45 at Gryphon. Come and support Leeds VC in their revenge match against London Lynx 2. Leeds travelled down to London to take on current division leaders London Knights. From the start Leeds took command serving tough and attacking through all front court positions. Knights never recovered and went down to 13 points. Leeds kept up the pressure in the second set serving tactically and always controlling the set. However Coach Speers tried to focus his players to reduce the errors that started creeping into their game. Leeds eventually took the 2nd set to 22. Service errors and poor passing allowed Knights back into the match. Their star opposite player No. 1 finally found his range and started the Knights' revival. Leeds fought back and levelled the score at 23-23 but 2 unforced errors cost them the 3rd set. With some well placed shots from Knights' No.1 attacker Leeds found themselves trailing in the 4th set. Coach Speers used all his players in this set to try and disturb the growing confidence of Knights but service and block errors cost Leeds the set losing 20-25. At 10-6 down in the 5th set Gregory took the service initiative and pulled 3 points back for Leeds. This seemed to revive the Leeds attack who through strong hitting from Herczeg and clever setting and attacking from Capt. DiFederico put them back to 14-13. Knights went for their final attack through 2, putting their No. 1 hitter against Herczeg's block. His attack went out, off the net, and missing the block completely. Joy turned to disbelief as the ref call a net fault against Leeds. Knights No.1 threw caution to the wind and attacked the Leeds pass with a jump serve. Poor communication caused Leeds to miss-dig the pass, 15-14 to Knights. Their No, 1 went for the kill with another jump serve but was so focused on his game forgot to serve from outside the court! 15-15. Telis took the set and match for Leeds with a block then a clever half speed attack. 17-15. Leeds travelled to the Black Country for their third match of the season, and handed caps to new prospects Kirkpatrick and Turnock, with Teale adopting her vertically stature aligned position; Libero. Leeds seemed to be cruising in the first set, and sauntered in to a slender lead at 21-20. However, the failure to accelerate to full attack speed in a timely manner, after a long taxing journey, led to collective minor lapses in concentration, and allowed Redhill to steal the opening exchange. And so proved to be the case, as in the second set Leeds fought them at the net and in defence, and with growing confidence and growing strength they fought from the service line, and perversely, occasionally they fought them during the time-outs; and they never surrendered. Slap happy Edine Pape had an important point to make. After limited success when attempting to be both subtle and clever with her shot execution in the first set, she resorted to using a line shot pile driver. Hitting a winning line shot once. Then coming back and hitting it again. Then hitting it a third time, with a tremendous whack. Leeds’ Tiger taming act was far from complete, but the die had been cast by the ringmaster. In the third and fourth sets both Breaks and Porter consistently finish rallies through four, and Turnock chipped away through the middle, despite suffering mild symptoms of achondroplasiaphobia. The Leeds Academy team, playing only their second ever fixture, were pitted against early Yorkshire Premier League leaders Barnsley Scorpions. Fielding a number of new players, the Academy were still gelling as a unit during the opening sets and this proved fateful as they quickly fell two set behind to an established Barnsley team. 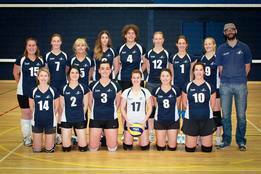 Cameron and Babin returned from volleyball career breaks, with an appearance for the Academy team. Their ‘je ne sais quoi’ improved in the third set, and with contributions from Gordon, helped to secure a foothold back in the game for Leeds. Unfortunately for the Academy, the response from Barnsley was quick and decisive, and they closed out the match in the fourth. With much more to come from a developing Academy team, rolling-back-the-years, Coach Speers, expressed her satisfaction at the improvements the team is making. The opening league game of the Yorkshire Premier season saw Leeds Men's 2nd Team take the long trip to Sheffield for a late kick-off. With only 7 fit and available players, including debutants Jamie and Dan Thompson (secured on free transfers from York), and the fact that this newly-formed Sheffield team were somewhat of an unknown quantity, the possibility of a tough game had already reared its ugly head. Even prior to the warm-up, and before a ball had been hit in anger, Stuart Williamson observed that they 'looked' good. And so it proved in a very tight opening set with Leeds managing to stay in touch until the latter stages when Sheffield pushed home their advantage through some strong serving, winning it 25-21. The second set looked to be heading the same way and Leeds soon found themselves staring down the barrel of an 8 point deficit. However, a vast improvement in service reception, particularly from Moghtader and Bakula allowed Potter to distribute sets to all hitting positions, somewhat akin to Jan Molby leisurely spraying passes around in his Liverpool heyday. Leeds managed to claw back the deficit and despite a nervy finish, clinched the set 25-23. The momentum was with Leeds now and Sheffield's policy of rotating their large squad was not helping their cause. In the third set both teams traded points and, despite raucous home support from a strong Saudi contingent, Leeds pressed home their advantage taking it 25-20. The home team were now looking completely disconsolate and the visitors went for the jugular. Thompson junior was now well into his stride on his début, passing and hitting like a demon. Superb defence from Leeds, including one spectacular dive from Stuart 'Pancake' Williamson that even Ashley Young would've been proud of, combined with clinical hitting resulted in Leeds comfortably taking the final set 25-12. Great team performance and a fantastic winning start to the season! Leeds VC unveiled their newest venture, the Leeds Academy development squad, who will compete in the Yorkshire Premier League. The team is set to be a mixture of youth and experience, with the youthful becoming more experienced, and the experienced working off the after effects of coffee mornings and mothers ruin. The endeavour of travelling to Barton-on-Humber took its toll, and Leeds lost a relatively close first set to the Humberside outfit, although the Academy increased their momentum in the latter stages. The second set brought better fortune and strong middle attacking from Hills and Hall swung the set and match in the Academy’s favour. The third and fourth sets followed suit with the Academy pushing home their momentum advantage. Senior senior, Coach Speers, rolled back the years, whilst junior senior Lawton and senior junior James kept the fires stoked with consistent attacking. Junior junior James attempted to wear the number off the Libero shirt, and even earnt plaudits from HEYVA’s coach. A great winning start for a new team, and moreover a fun experience for all. Leeds Academy’s next match will be against league leaders Barnsley Scorpions @ The Gryphon, 6pm, 12th Oct. Where analysts predict the sales at independent Coffee Shops and off-licenses in the Yorkshire region will remain low for the second consecutive weekend. In the first match of the season all 14 players turned out to play and support the team. Special thanks to Tinkler and Bugayska who sat out this match to score/support the team. The game saw returning setter Teasdale and new player Mazurek join the team along with new playing positions for Tarrant, Carrick, Teale and Tseka. The first set started well with excellent service pressure, aggressive attacking through 4 and 2, and intelligent setting from Teasdale, the first set was rounded off with a run of 13 straight points from Gregory. The second set continued in the same vein, an improved Harrogate defence proved difficult to crack but the attacking prowess of captain Pavanetti, Tseka and Mazurek proved too much. Several changes to the starting line up in the third set allowed Harrogate back in to the game and take a lead of 18-14, but coach Gregory re-introduced Pavanetti for an 11 point service run to close out the game, assisted by some excellent defence from Aulton, Carrick and Pentecouteau, blocking from King and attacking from Austick. A great win to start the season, well played girls! Leeds fielded 11 of their 13 registered players for their 2nd game of the season. Coach Speers took the opportunity to try out his new middle attack player Adil and Libero Gregory. Riga started strong with power outside hitting and strong service pressure. At 18-21 down Coach Speers took his 1st time out, asking his players to focus on their service and block. Riga tried to use their advantage but failed, making unforced errors. Leeds stole the 1st set. The 2nd set saw Leeds captain DiFederico (10 points) & power attack Herczeg (5 points) serve Riga off the court. Huge blocking from Rutikanga, Sibanda and Adil completed the destruction and 2nd set. Leeds took advantage of the Riga player switch in the 3rd set, attacking at will through the improving 1st pass from Gregory. Setting all positions Leeds pulled the Riga block apart, taking the 3rd and final set. Just 9 players travelled to the 1st game of the season for Leeds. Coach Speers fielded his winning players from last season leaving his new players Gregory & Puard on the bench. Leeds looked nervous from the start and Staffs took advantage of this taking the 1st set. Coach Speers switched his rotation 3 places trying to match his strongest block against Staffs main attack. The tactic worked putting Leeds back on level terms. Leeds maintained their performance putting Staffs under strong service pressure and outside attacking from Herczeg, Rutikanga & Teles. They took control winning the 3rd set. Staffs main attacker twisted his ankle early in the 4th set, substituting him for one of their England U19 cadet players. Leeds tried to capitalise on the change but lost control of their service and receive allowing Staffs back into the game. In the final set Leeds had many chances to take control, but errors cost them the final set and the match. The opening weekend of the 2014 season saw Leeds Ladies national league team play their second match in so many days, and continue to build momentum. With only six players available, team members again had to perform out of position, and fulfil roles that were not necessarily their forte. Regardless of these challenges, Leeds rallied well and battled for each other more than in the previous day’s fixture. After a slightly disappointing first set, where Coventry’s very experienced attack consistently found gaps deep in the Leeds defence, self-belief from Breaks with support from the rest of the team saw her serve 12 points straight to close out the second set, and level the match at one all. With the door unlocked and McAulay wearing new shoes, Leeds sensed an opportunity to push home their momentum advantage, but Riga were not to be so easily contained. Riga showed that they hadn’t come to Leeds just to get out of Coventry for a day, and overcame Leeds' euphoria by stepping up their own service pressure, ground strokes, and ibuprofen dosage. The seeds of future organic improvement are evident for Leeds to harvest, and improved results will show from time and work in the training gym. Greater squad depth and position specialism could create short term performance opportunities, and there is much more to come from this very new group of players. MVP & CMVP - She has what it takes, it's Nicola Breaks. It was a gutsy Leeds performance from a newly formed group of players; some stepping up national league standard for the first time, others returning from injury and a brace of new signings to the club. Leeds travelled with a straight six players to the season’s curtain raiser, played in front of a packed auditorium in Stoke. Having successfully learnt each other names during the warm-up, Leeds leapt out of the blocks the fastest to take the first set by the narrowest of margins, powered by battling defence from Captain Porter and new signing Breaks. Stoke, a team that suffered the ignominy of demotion from Division 1 last season have set out a mandate for an immediate promotion, and with the benefit of a large squad they had changed their entire team by the start of the second set. Working hard in service receive, Leeds stayed within touching distance until the business end of the set, but were unable to ever completely draw the score level, and Stoke crept over the line to make it one set a-piece. The third and fourth sets ebbed away from Leeds early in the play, despite multiple coaching time-outs. With momentum on their side, Stoke’s barrage of service ordinance and disciplined defence provided them with breathing space, and they were able to relax and fully express themselves in front of an increasingly partisan crowd. With limited training and match availability to date, it was a promising performance from a fledgling Leeds outfit that with commitment and effort will grow throughout the season in to an ever more coherent and competitive unit.